The Chicago Botanic Garden is much more than just a lush paradise of plants. Stretching across 385 acres of land, consisting of nine islands, and bordered by four defined natural habitats, including Skokie River Corridor, McDonald Woods, Lakes and Shores, and Dixon Prairie - it is a huge natural wonderland running parallel to Lake Michigan. Besides providing a prolific display of a broad variety of gardens for the enjoyment of visitors, the Chicago Botanic Garden has undertaken the objective to promote an understanding and conservation of Nature. On site is a selection of establishments, including the Joseph Regenstein, Jr. School of the Chicago Botanic Garden, where a plethora of horticultural classes are offered, including plant science and gardening arts; the Center for Teaching and Learning, where youth and teachers are invited to take advantage of the wealth of information on plants and nature; the Institutes of Plant Conservation and Ornamental Plant Research, supporting research and efforts to uphold conservation; and Horticultural Therapy and Community Gardening, extending services and programs to community outreach. Visitors on foot can look forward to complimentary admission; however, should you find it necessary to arrive in a vehicle of your own, there is a $20 parking fee—with membership, this fee is waived. Strolling through the Chicago Botanic Garden, patrons can expect to find a huge variety of landscapes and habitats, such as the Green Roof Garden on the Plant Science Center, the English Walled Garden, Japanese Islands, the Great Basin, and even a San Francisco train model amidst the flourishing flora and vegetation of the gardens. 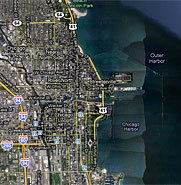 It is located about 25 mile north of downtown Chicago and about 10 miles north of Evanston.